Neal and I just love Alaska! If you haven’t been, let me suggest taking a cruise through the glaciers. 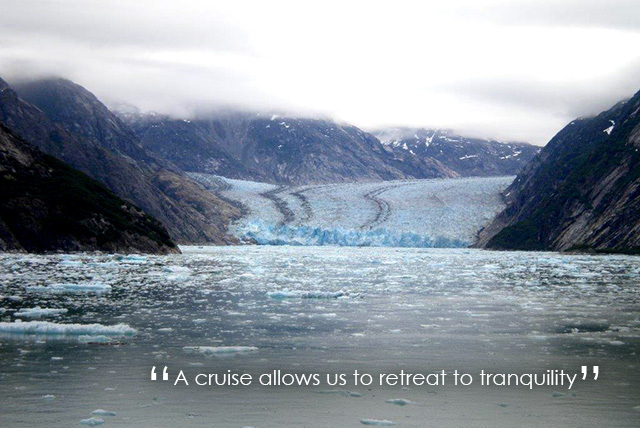 In our hurried world, a cruise allows us to retreat to tranquility and to observe the untouched shores where glaciers touch the water. Now I had heard about glaciers my whole life and really never expected to see such a splendid sight. 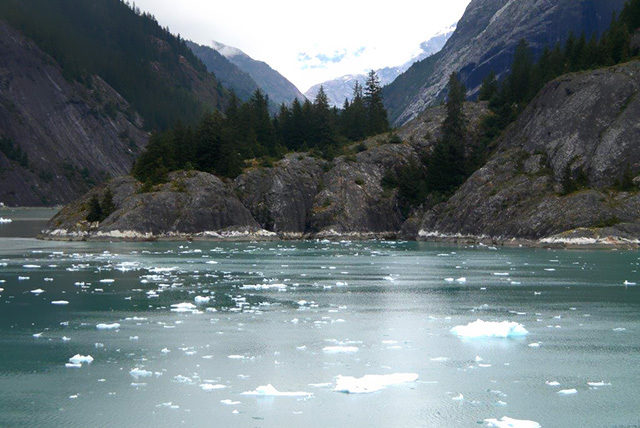 As the ship moved into Glacier Bay, there was a hush of respect for the untouched nature that was before us. We watched the wildlife in the freezing cold turquoise waters move onto icebergs to rest. The cold air was refreshing and chilled us to the bone. When the glacier would break and a slice would fall into the water, a loud thundering sound would echo down the Fjord. We stood in awe of the majesty of creation. When we got married, we took all our children and grandchildren on this cruise to celebrate. Don’t be afraid to bring children because even the youngest will adore this cruise. Everyone in our family came away with favorite experiences from salmon fishing to eating smoked salmon and local cuisine in the villages. Neal and I love to stroll and explore the wonderful little towns in Alaska. I always find quilt shops and buy fabric and yarns native to Alaska. What a treat! If you want to see splendid scenery and nature at its finest, take a cruise through this beautiful state. You will create memories that will last a lifetime. Tell me: Are you planning on taking a summer cruise? Any tips or insight you’d like to share? We are on our way to Alaska on our first cruise July 7! Would love any advice .. How soon in advance do you have to book the tundra wilderness tour? We are visiting family as well…very excited!!!! We are leaving on an Alaskan cruise later this month. Any suggestions as to excursions? You’ve brought back some lovely memories! 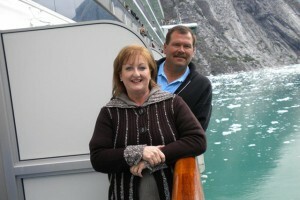 My husband and I had a wonderful time cruising Alaska in 2008. One of the most beautiful places Mike and I have visited. We went with several couples from church. We had a wonderful time seeing all of God’s beauty. It was so special because one of our friends who went with us was diagnosed with cancer just a month or so after we returned and passed the next year. He enjoyed the trip so much as we all did. Good memories. One place I would definitely go back to. One of the most spectacular places on earth, absolutely nothing else as beautiful as the cruise thru the National park ending with the largest glacier in all its majesty. The silence is deafining and it makes you feel like nothing else we have ever experienced. A must do for everyone! Love your blog. Your photos are gorgeous! 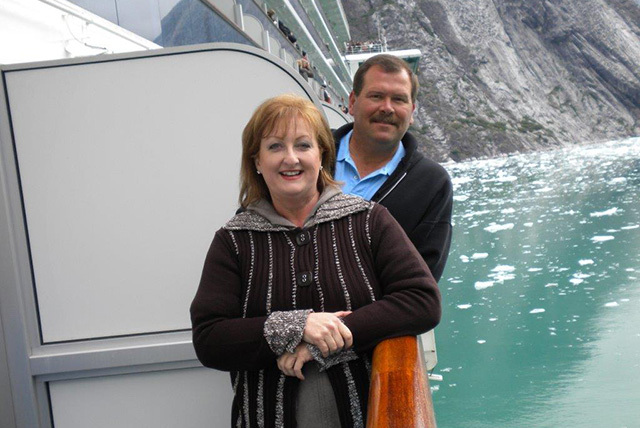 They brought back some wonderful memories of the Alaskan cruise my husband and I went on several years ago. It was amazing to see the baby seals floating on the ice bergs, the orca and, humpback whales swimming and all the eagles soaring in the skies. 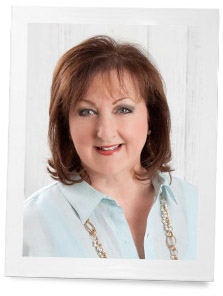 Thanks for sharing your favorite stories, Phyllis! I’m Alaskan, born & raised, an Alaskan cruise is on my bucket list! Alaska is so beautiful and I can’t believe I’ve only experienced a tiny fraction of the beauty this state has to offer! I cant imagine the length of time it would take to explore the state. It is one of the most refreshing places to be. I cant imagine living there and seeing this all the time. Have fun….and take lots of photos! I have a land/sea cruise already booked for September…very much looking forward to this trip! Why yes we ARE cruising to Alaska this summer…via Oceania…hope to run into a few folks from our last adventure up the eastern seaboard! My husband and I got married aboard a cruise ship docked in the harbor outside of Vancouver, BC Canada. Our honeymoon was a cruise to Alaska. I love Alaska, the glaciers are so beautiful! I hope to go back again one day and see more of this beautiful state. Oh my goodness, that is a dream wedding. What a great idea. 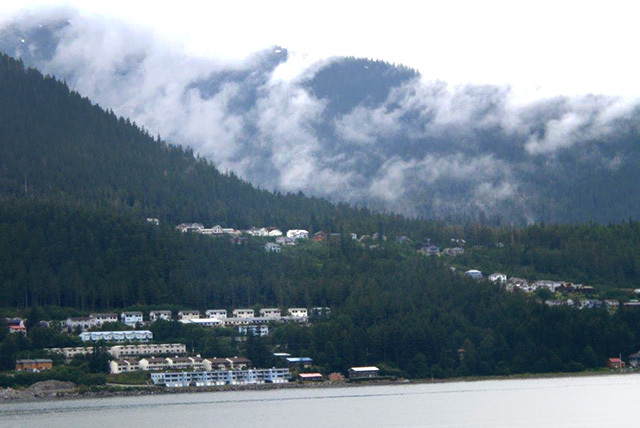 We experienced a land and sea Alaska trip a few years ago and it is still my favorite trip. We are taking an extended cross country trip this summer. I am already thinking about another Alaska trip next summer. Maybe a bus tour this time. We took a land sea tour of Alaska. It was wonderful. Never forget it. The glaciers were so amazing. Saw lots of whales. A trip everyone should take. Our family did one of these cruises out of Seattle a couple of years ago. One of the most spectacular places ever. We were fortunate enough to go into the Tracy Arms fjord, truly unforgettable. So happy to read this! This is a cruise my husband and I definitely intend to do, but this year no cruise – just time on a beach in Kauai. Thanks for sharing your lovely photos! My husband and I took a land/sea vacation to Alaska last summer and we especially enjoyed the “Tundra Wilderness” tour at Denali National Park. Alaska is so beautiful. Alaska is a truly wonderful place. My husband and I celebrated our 25th anniversary on a cruise to this beautiful place. We are hoping to return and take our children and granddaughters!